Yesterday I came home to the most amazing gift I’ve ever received. My jaw dropped. I cried. 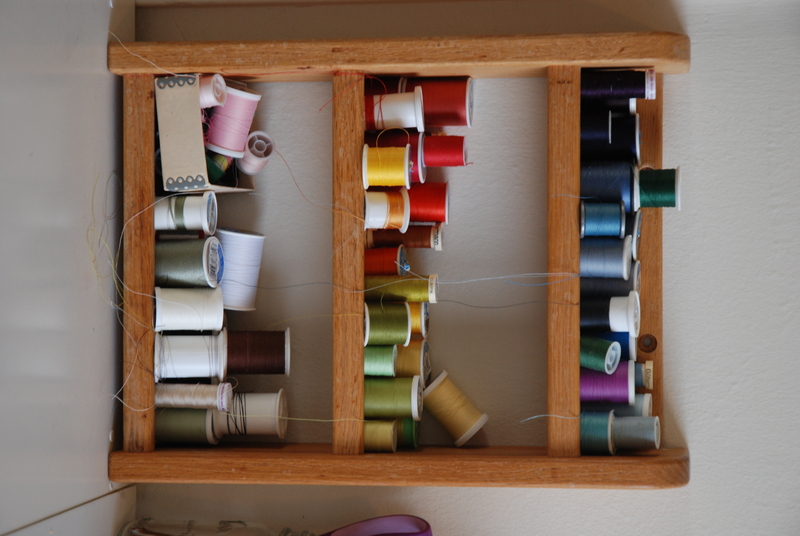 This is NOT what my sewing set-up looked like when I left for work! 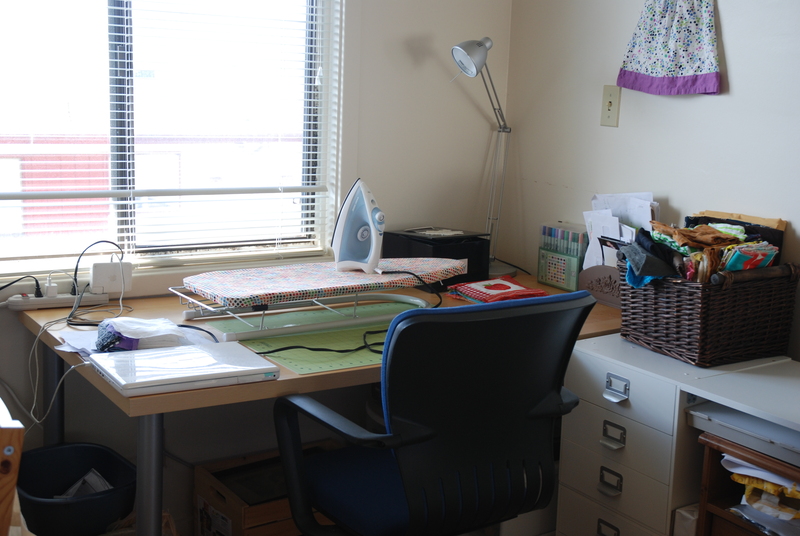 Hideko and our very good friend, Sanjai, spent the day cleaning, clearing, building, reorganizing and rearranging to give me the most amazing sewing/crafting center ever. I feel like the luckiest girl in the world! 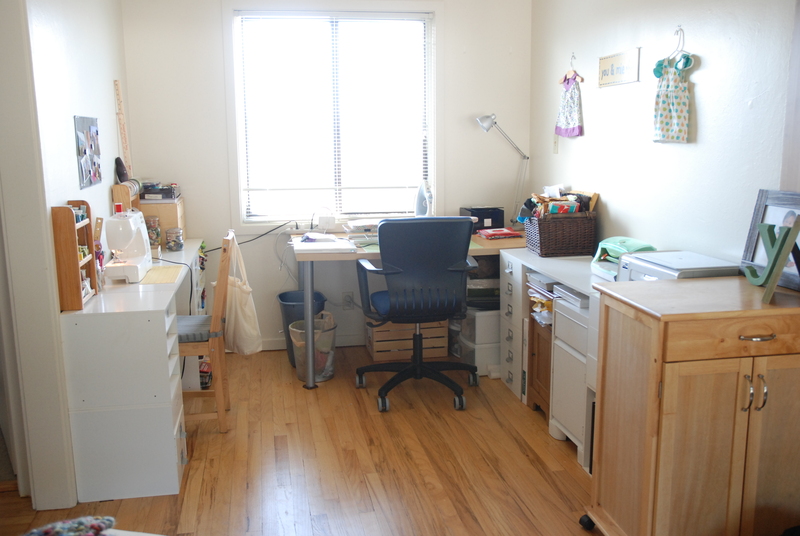 The left side of the “office” was always mine and I’ve had this narrow desk set up for sewing since we moved into this apartment. 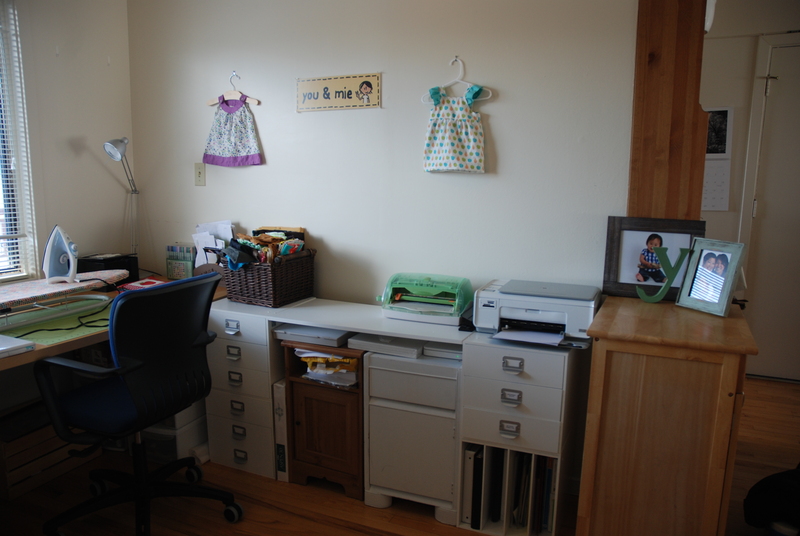 But the large desk was Hideko’s and there was not nearly as much storage or desk space on the right. She cleared off the entire desk so I can use it for sketching, cutting, and ironing (and of course for Hideko to use too). Hideko had this sign made for me! We’re not quite sure what to do with it yet, but it does make me feel quite official. 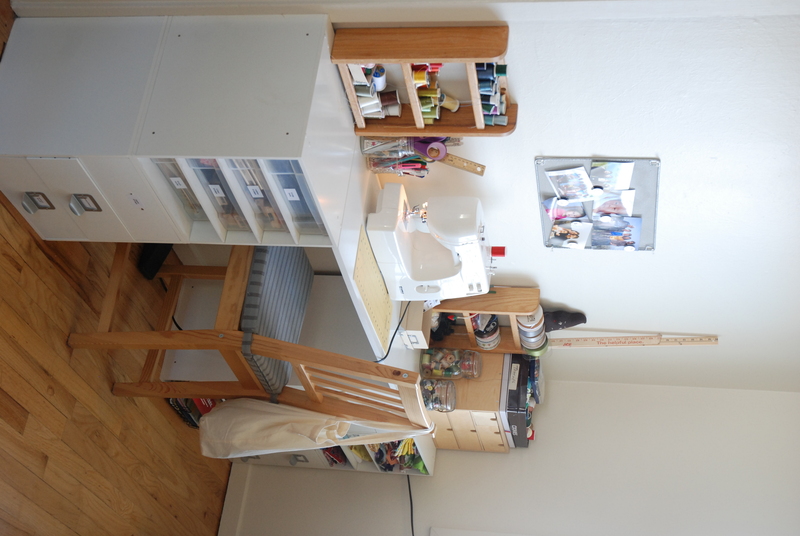 I LOVE my new crafting area – I’m still in disbelief that I get all this space!! I guess Hideko was tired of seeing me hunched over on the floor. Although, I do enjoy working on the floor sometimes, this is definitely an appreciated upgrade. Not only is the space a gift, they cleaned up EVERYTHING for me! I will not deny it, I am a total slob. Before yesterday, there were piles of fabric, patterns, unfinished projects, clothes and other crap all over this office space. Sanjai was shocked that I could get anything done in that mess. Now I have to work really really hard to keep this place clean so I can use it efficiently. And it’s not quite done yet. I’ve had shelves that I’ve wanted to put up over my desk for a long time and some other new organizational and decorating ideas. But I’m inspired and touched and so motivated. 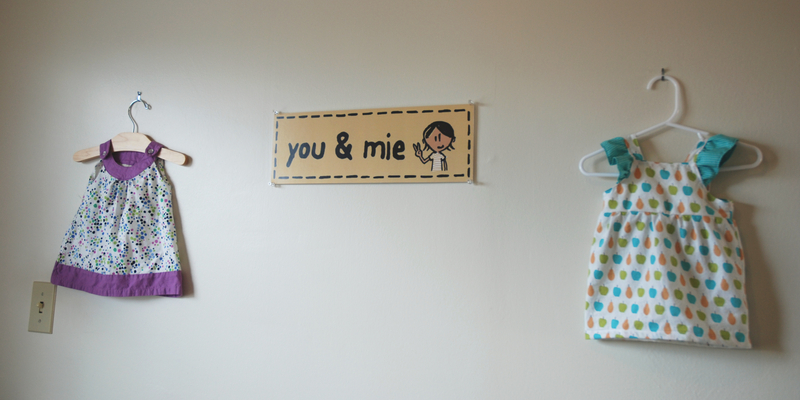 Hideko and Sanjai – thank you for the most amazing gift ever. Thank you for believing in me. I hope I can make you proud. This entry was posted in other and tagged best gift ever, craft center, work space by Cherie. Bookmark the permalink. It looks fantastic! You lucky ducky! This is so sweet!!!! I want to cry just thinking about how you walked in and cried!!! Good work Hideko and Sanjai! It’s lovely!!! Isn’t it amazing? And then a bunch of family and friends pulled together to get me a new sewing machine! I cried then too.